I was undertaking a project on a private property near Enmore, south of Armidale last weekend. This gave me the opportunity to visit some abandoned mine sites and have a look at the country. The property I was on consisted of two stratigraphic units, the Girrakool Beds and the Enmore Monzogranite. The area I was most interested in was the boundary between the two units. Where I was the boundary is defined by a fault known as the Borah Fault. The fault zone is quite easily observed through topographic and drainage features, but also there has historically been some gold extraction from some locations along this fault including two mines that I got to visit (Buffalo Ranche Mine and Sherwood Mine). These mines make up part of the area sometimes referred to as the Enmore-Melrose Goldfield. The regional geological mapping identifies that the north of the Sherwood Fault are blocks of the Girrakool Beds. This geological unit is dominated by mudstone (slate) and greywacke (lithic sandstones) with rare chert and basalt (Gilligan et al 1986) and is sometimes considered of Permian age (e.g. Binns 1966, Leitch 1974) but is more likely Carboniferous Gilligan et al 1986). It appears to me that the Girrakool Beds in the Enmore area have not been studied extensively but other areas well to the North east of Armidale have been much more studied because in that area they have undergone extensive and complex metamorphism. South of the Borah Fault, as well as some fault bound blocks to the north of it is the Enmore Monzogranite. The Enmore Monzogranite is a name given to a biotite monzogranite of S-Type derivation (from melted sedimentary rocks) commonly with a foliation (preferred direction of mineral alignment). The quartz in the unit is usually of a blue colour and there is occasionally amphibole. garnet and even some graphite present in some places too. It commonly contains xenoliths. The Enmore Monzogranite has been classified as part of the Hillgrove Supersuite. As far as I can find, the Enmore Monzogranite has not been dated accurately and therefore only has an inferred age of Carboniferous or Permian. The Borah fault can be traced for quite some distance because the faulting has affected the rocks (which area now called mylonite, breccia and fault gauge). The shearing stresses caused by movement along the fault has recrystalised some of the rock and broken up other areas. Because of this action the affected rocks have been weakened and are more susceptible to erosion. This means that over time creeks have preferred to flow along the fault strike. For example one creek, Postmans Gully flows along the fault towards the north-east and another, Borah Creek flows along the same fault in the opposite direction (towards the south-west). Some old mining equipment still remains at Sherwood Mine, with the remnants of a steam engine apparently manufactured about 1878 still visible. Historical mining records (Henley 1985) show that approximately 7.9kg of gold was extracted in 1893 then in the period up to 1937 a further 2.6kg was produced. Follow up exploration was carried out from time to time, particularly in the 1970’s to 1990’s but no significant economic concentrations of gold were identified. I note that the geology superficially appears similar to the nearby Hillgrove mines area but on further inspection it appears that all of the substantial mineral deposits lie in a thin zone around and along the fault line. The mineral deposits are also of a quite different chemical make up with low concentrations of Antimony, which distinguishes it from the major mineralisation events that formed many of the Gold-Antimony deposits from the nearby Hillgrove Gold Field. As mentioned, the most significant gold occurrences in the Enmore-Melrose Goldfield are located on, or adjacent to the Borah Fault (and nearby Sherwood Fault). This indicates the faults are likely to be a structural control on the gold mineralisation. This year marks the 85th birthday of the Binna Burra Wilderness Lodge in Southern Queensland. As part of the 85th celebrations the lodge has invited many people to give talks at the lodge between the 20th and 24th of June. There are many interesting science and nature talks open to the public on these days and two of the talks will have a geological theme. The Lodge is situated on the northern side of the Tweed volcano and the landscape and ecology of the area is intimately connected with the geological history of the area. I will be giving a talk on the evolution of our understanding of the Tweed Volcano over the years and how politics can affect how we scientifically look at our part of the world. My talk will be on Friday 22nd June at 9.30am. On Sunday 24th, Warwick Willmott will be giving a more geology overview walk and talk including discussions on how the Tweed Volcano and Hawaiian Volcanoes have many similar characteristics. UPDATE: Due to personal matters I have had to cancel my talk. The Talk by Warwick Willmott on Sunday is unaffected. Our understanding of the Tweed Volcano: A Learning, Unlearning, Forgetful and Confused Experience. The landscape of the NSW/QLD Border (Lamington and Tweed areas) being the result of a single volcanic centre, has been recognised formally for less time than the establishment of Binna Burra Lodge (only 70 years). 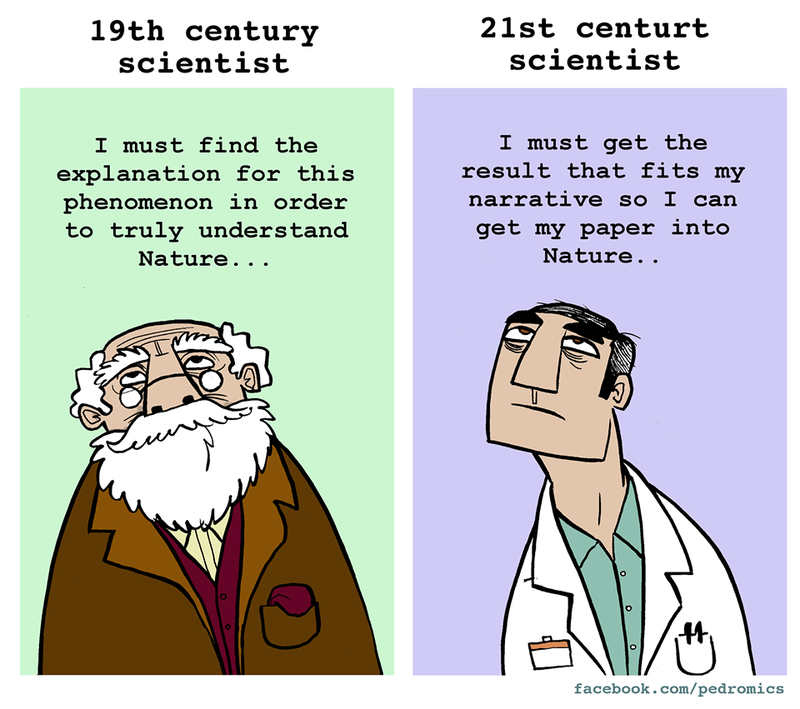 Since this first realisation, many researchers have added to understanding of how the landscape has evolved. However, sometimes even in our modern and scientific world new knowledge can get lost, be ignored, or repeat old myths. This talk will cover some of the evolution of our understanding of the Tweed Shield Volcano and examine some of the persistent ‘popular science’ myths of this landscape. Firstly, I need to apologize to all the commenters who have not had their comments published. The old regular visitor crowd will have noticed the blog has become fairly inactive over the last few months. Given the number of comments placed and the continuing interest (including an invitation to speak just this morning) I should really do a lot more... and I will. I have recently had a few interesting journeys which included work near Nymboida on a new quarry and also visited an old quarry with some really interesting fossils. I've also noticed some interesting rock alteration in a road cutting on the way to Valla and I've been spending some time at a friends place near Glencoe at a place called Mount Mitchell. All of these are worth blog posts and I shall try and get to them at a rate of at least one a fortnight. Yesterday, following the rare experience of a noticeable earthquake in our region, I provided a very rough map of the location of earthquakes in preceding 24hours to the one many people felt. I have since incorporated earthquakes since and for the week before. I've also increased the area we are looking at. Mapping is all about enough data, and enough decent data. Collecting the data is essential and then looking at it so see whether it adds to the story helps us understand the world in which we live. Geoscience Australia provide an excellent online service to the public showing all the earthquake activity in our Country. Yesterday's post had enough data to demonstrate that there appears to be little relationship between inferred or known faults in the region and the location of earthquakes. More data since means more interesting features! A comment from a reader asked about the trace of the Demon fault system (a system that is very evident even today despite it being apparently inactive for many millions of years). I have included a thick pale blue line that roughly approximates the Demon Fault system strike. The map I have just updated implies that there is a fault system previously unknown. I have included a line that approximates the pattern of many quakes in area. What is interesting is that the apparent line of most quakes is perpendicular to the old Demon Fault. It is also interesting that the 'major' 4.2 quake is separate from the apparent line of quakes experienced in the last week or so. It is likely that the quakes in the Nambucca area are a parallel line of stress to the most frequent quake trend. Either way, the map says more that I can so have a look and tell me what you think. *Update: At least three more quakes have been identified (one occurred since the above map) and another couple which was subsequently identified after cleaning out the background 'noise. I also note that the quakes were almost entirely situated in a structural block known as the Nambucca Block. I guess another post will have to be done since the Nambucca Block provides insights into the way the New England Orogen has formed (Shaanan, Rosenbaum & Ranauld 2016). Earthquakes are a bit infrequent in our part of the world. So, when one is big enough to feel happens there is usually much excitement. While in my home office a few hours ago (1.30pm this afternoon) I felt a strange sensation and the roof of my studio shook. About 1 minute later, my wife came up from the house and asked if I had felt something, because the house shook for a moment. 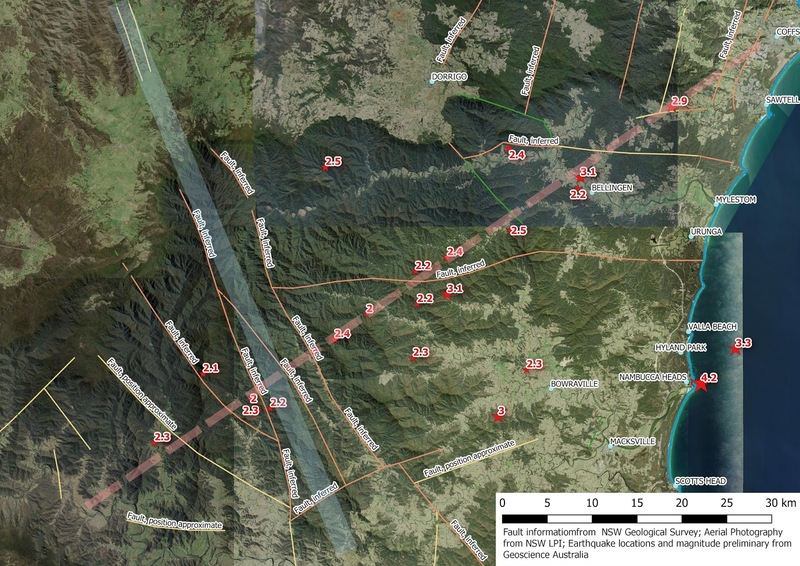 So, onto trusty Geoscience Australia Earthquakes page I went. 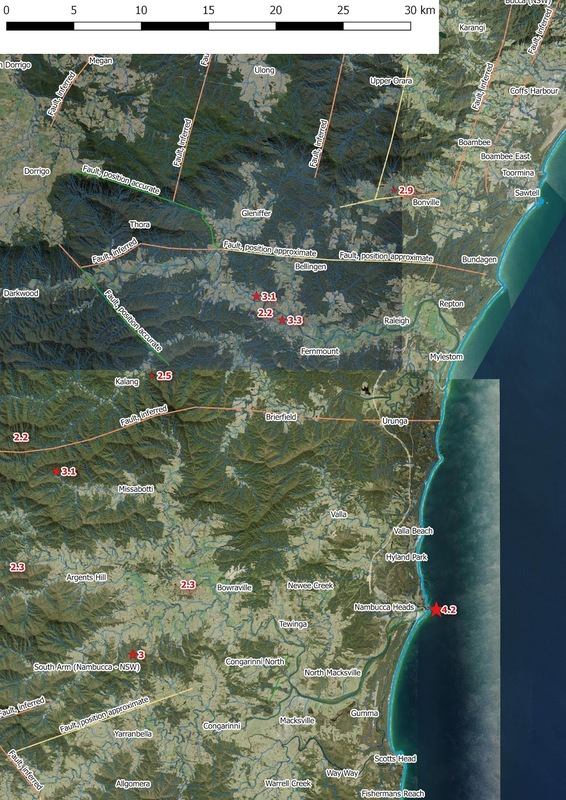 Sure enough a substantial (by our standards) quake hit somewhere under the ground near Urunga. 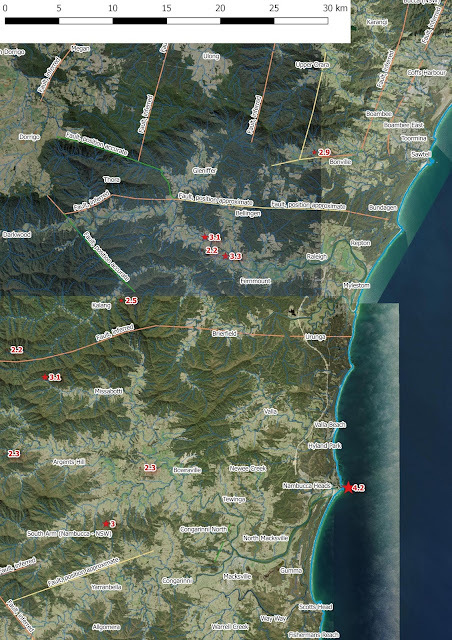 *Since posting the above, the earthquake epicentre has been updated to near Nambucca Heads the hypocentre being approximately 10km below Nambucca Heads. Social and Economic Pressure on Nature (SEPON) is fun! I'm enjoying the development of this index which will hopefully provide a guide to the pressure and utilisation of natural resources in just about any geographic area in Australia. In my introductory post I outlined some of the concepts that I would be adopting. This post is, however, mainly just an update and examples on some of the output of the SEPON model and a note on a couple of model tweaks. First the tweaks. At very high resource pressures the model 'gave up'. There was little ability to differentiate at these high pressures. Essentially, the model could not determine whether a very high pressure was different from a moderately pressure. I've introduced a tweak in the index to slightly better resolve the higher end of the natural resource pressures essentially giving the model the ability to differentiate between 'Moderate', 'High' and 'Very High'. Interestingly, this change seems to have affected rural SEPON index values more than cities, pushing some scores up, especially due to the effect of transport pressures. For example Byron Shire Council which already had a relatively poor score of -9 actually turned out to be a -13. Walcha Shire Council had its value of 6 reduced to 2 (remember a ore positive value indicates an increased likelyhood that people are using natural resources of the area in a sustainable way and vice versa). What is a surprise is that people that live in Byron Shire Council and Sydney City now have equal scores. My gut feeling is that the effect of transport (D5) is too highly weighted in the model... I'll have to go through the assumptions again and double check. There might be another tweak needed. 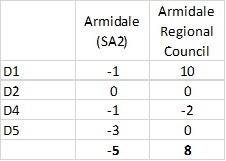 An example I'd like to show is the difference in scores in two areas Armidale Regional Council and the Armidale ABS Statistical Area (SA2). The example on the right serves to demonstrate that the Armidale ABS statistical area has an apparently overall adverse pressure on natural resources, however, the whole local government area is apparently sustainable. I.e. The manner that people use natural resources in the rest of the LGA effectively 'subsidise' the Armidale ABS Statistical Area. This seems a fairly reasonable observation especially relating to the pressure on land resources (D1). Note that this model was run before aforementioned tweak was made for high pressures. Also, I wanted to show what happens when I start applying preliminary aspects of the Natural Resource Utilisation (NRU) concept to the Armidale Regional Council and Armidale ABS Statistical Area. Unfortunately the selection of these regions is not necessarily very good with regard to illustrating NRU, a more built up area such as Sydney might illustrate the concept better. Essentially the scores were unchanged for those two areas... I think that the adjusted SEPON index value including NRU for Byron and Sydney LGAs might be a good one to run through. I speculate that this will make Byron LGA better than Sydney. but that will be a future post. Socio-Economic Pressure on Nature (SEPON) is an index under development to provide a semi-quantitative method to estimate the likelihood an individual in a given location is having a negative or positive impact on Earth resources. The present draft version of SEPON provides an index value of between -40 and +40. If a geographic area has a value of 0 a person living in that geographic area is 'likely' to have little impact on the long term environmental condition of the area. The higher positive number indicates an increased likelihood that a person living in that geographic area will have a net sustainability. Conversely a strongly negative value means that the impact of a person living in that area cannot be sustained overall by that geographic area (i.e. the 'footprint' of all the people living in that geographical area extends beyond the areas geographical boundaries). Example output from SEPON for selected local governments. areas. SEPON can be applied to small (e.g. suburban scale) or large areas (e.g. states) where consistent data is available across those areas. The draft index datasets is presently very NSW centric and includes Roads & Maritime Services vehicle data, Australian Bureau of Statistics population and dwelling data, Human Services negative income and long term transfer payment data, Office of Environment and Heritage landuse data and more. The example provided shows the very minimalist output at this stage. The final line with the bold numbers is the SEPON index value. The example areas are local government areas and I think that they are somewhat intuitive when you consider the base information fed into SEPON. People in the Sydney City Council geographical area appear to generally have a footprint a fair bit greater than the actual geographical area. In other words Sydney City Council requires more natural resources to sustain it than it actually could ever sustain within its geographical area. The main reason for this is the arable land required to sustain the population and the nature of housing the population. Sydney City Council appears to be a net 'consumer' of natural resources. Compare Sydney City to the Walcha Shire Council area. A lightly populated area in the New England tablelands, Walcha overall appears to be a net 'supplier' of natural resources. However, some factors such as transport generally has a relatively substantial negative natural resource impact and therefore the area doesn't have a very high positive value. Compare this with Byron Shire, which although predominately rural in nature has a very high demand of natural resources. 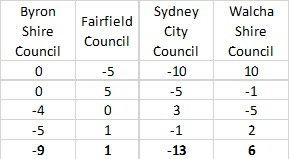 Surprisingly, and maybe anomalously, Fairfield Council has a near neutral SEPON index value. This seems to be particularly due to the manner in which transport is used, the manner in which the population is housed. I will need to return to the index to undertake some qualitative analysis to determine if this is reasonable or not for this local government area.